A few days ago, I felt like I was at the end of my rope. So many stressful events happened one after another, pulling me in so many different directions that I just couldn’t take it anymore. All I wanted to do was find a dark corner and hide from the world. About the only thing that I felt like doing was playing Lego Batman on the Nintendo DS. Last August, I wrote about NHL’s and my gaming addiction. Since then, we’ve moved from Lego Harry Potter to Lego Indiana Jones and from that to Lego Batman. I really like that Lego Batman lets you play in "Villain Mode" to help further their evil schemes… But more on that when I get around to reviewing the game. I’ve found that, when I get stressed like this, I don’t function well. All of my motivation to do that tasks that I need to do disappears. Making myself complete them seems as hard as scaling a mountain. Instead, I need escape from the situation. Since I don’t have any friends locally, I can’t just head out with the guys. Cooking is sometimes a stress reliever, but then I need to clean up from the cooking which adds more stress. Watching TV will sometimes suffice, but I like being actively involved and feeling like I’m accomplishing something. Lego Batman isn’t so difficult that I’ll get frustrated by it. And yet, it isn’t so simple that I feel like I’m not surmounting a challenge. I can play it for a bit, allow my mind to forget all of my stressful thoughts for a time and feel like I’ve accomplished something. 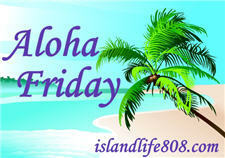 My Aloha Friday question for today is: What do you do when you’re stressed? If I’m really really stressed I clean, clean, clean. If just a bit stressed I either crochet or read or watch a good movie. Harriet recently posted..What’s this image stuff? Can you read it? When I’m stressed, I have to have some alone time so that I can either sleep or cry. Or, I also like to get lost in a good book or movie.